If you ever complained about homework increasing as the days got longer and the weather warmer, well, the tables have been turned. Ben Bertoli is up late doing a lot of it himself as the school year ends. Bertoli, affectionately known here as the commenter GiantBoyDetective, revealed ClassRealm—described as a "sixth-grade MMO"—to the general public through Kotaku a couple of months ago. A teacher in Indiana and a great lover of video games, Bertoli developed this gamification system in order to motivate his students to read more, participate in discussions more, study more and, well, learn more. By all accounts, it's been a big hit. "My kids, they're the best promoters," Bertoli told me. "They're going around and telling other students how great it is. In my classroom, other kids come in from other classes for math and science, and they see all the ClassRealm stuff on my wall and they want to do it. Other teachers also have been hugely supportive; they want to do it." Moreover, since his Kotaku article "I've been flooded with random emails: "I'm a teacher and a parent, I want to try this,' a lot of notes like that," Bertoli said. 'There's a small game developers conference at Bloomington [Indiana], they said 'We want you to speak.'" Unfortunately, he couldn't. "There was a grandmother from Arizona who wrote me," Bertoli said. "She said, 'This is the best thing ever; you're a genius.'" Hence the homework. Bertoli, with partners Courtny Cotten (a graphic designer) and Dave Mathew (a computer engineer) are building out a more fully featured web site to help any teacher implement a ClassRealm plan custom-fit to their students' needs. They've enlisted the help of illustrator Alice Carroll, hailing from Australia, too. Bertoli is quite serious about creating a very professional, mobile-friendly web application. He just has to do it in his spare time. His principal advised him to be sure to work on ClassRealm entirely at home, not because he doesn't support the idea, but to make sure there's no doubt who owns the idea if it becomes a success. "He really liked it. He was pleased to see the reaction. Of course, when I showed him the story on Kotaku, there was a post about Lollipop Chainsaw so we had to scroll down past that," Bertoli laughed. "But he thought it was awesome. "It's like I'm trying to keep two separate lives going," Bertoli said, "like I'm a superhero." 'The satisfaction really comes from seeing the kids get the concept of what they are studying,' says Bertoli. And, yes, all of this requires a Kickstarter campaign, which opened yesterday and will last for one month into June. 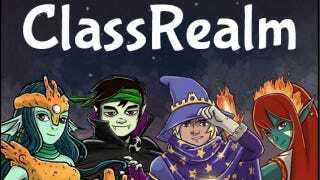 To reintroduce those who haven't heard of ClassRealm and maybe aren't in the sixth grade, the "game" is essentially an experience-point system that rewards players—voluntary participation is stressed—for the basic participatory acts of school: answering questions, helping others, recognizable effort. It gives out achievements for specific tasks, such as extra reading or free-writing essays without being assigned. MMO concepts such as alliances and random encounters also have analogues in ClassRealm. Kids pick a character "class" and race (zombies, vampires, ninjas and wizards are staples of the lineup) and they have a fantasy realm avatar to complete the connection to role-playing games. "The satisfaction really comes from giving the kids the motivation and then seeing them actually get the concept of what they are studying," Bertoli said. "If they're struggling in a certain thing, but they are pushing hard because they want the XP, or an achievement, and then suddenly it clicks, seeing that happen is really rewarding. The student feels like, 'I was going for XP, but now I am happy that I learned something.'" Bertoli, a recent graduate of the University of Indianapolis, reported great success with encouraging kids to read and write more through ClassRealm. But the web site he was using to administer the game—a Google doc, basically—was not streamlined, and managing the awarding of XP was becoming cumbersome with just a pencil and paper. That's where the web application comes in; it's as much to make it more manageable for himself as it is to make it accessible to a teacher who, of course, didn't create and may not understand the system. The illustrations and graphics, he says, are to complete the MMO look-and-feel and provide an inviting interface for kids, so they feel like they're fully participating in a game. The mobile friendly concept for the site is so it can be easily accessed on a smartphone or tablet as well as a laptop or PC. "If this had never blown up the way it has, I wouldn't have stopped," Bertoli said. He would have continued to implement ClassRealm in his class, because he's seen its results. Now others are excited about its potential to motivate their students. "At the time I thought I'd just tell my friends or guys on #Speakup about this, and they'd say, oh my God, this is cool, I wish my teacher would have done that. "I was talking about this with my principal today," Bertoli said. "He thinks it's great, and encouraged me to just keep working on it and adding to it." Which means the teacher is now the one taking home extra work as the last day of school draws near.